Spring has finally arrived in Lynchburg, bringing with it warm air, allergies and … football? Yes, football. 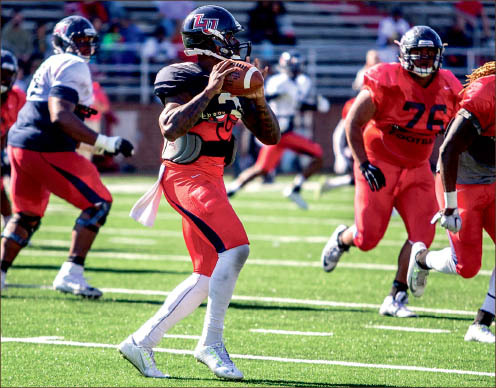 The Liberty Flames football team held its annual spring game April 16 at Williams Stadium in which the offensive unit defeated the defensive squad, 57-46. The offense scored on the final drive of the game to grab the victory on a gorgeous Saturday afternoon. The spring game employed a unique scoring system that awarded points to either side for every play. The offense was given points for actions such as explosive plays (a run of 10 or more yards or a pass of 15 or more yards) and touchdowns, and lost points for mistakes such as turnovers, dropped passes and penalties. Consequently, the defense was rewarded for causing turnovers, tackles for a loss and sacking the quarterback, and deducted points for mistakes such as penalties and dropped interceptions. Quarterbacks wore black jerseys, while all other offensive players wore white jerseys and the defense donned red jerseys. The game began in an unusual but stirring way. 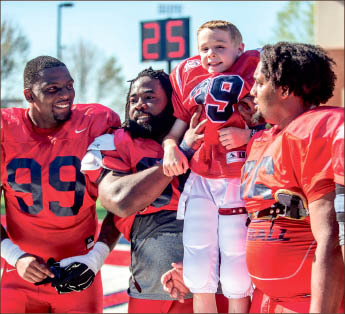 Nine-year old Nathan Norman, a Rustburg native who has battled cancer since he was two years old, took the opening handoff from junior quarterback Stephon Masha and ran 35 yards to score a touchdown to begin the spring game. Norman signed a national letter of intent with the Flames in February. In a contest that featured no special teams, the defense dominated early, forcing a three-and-out on the very first series, followed by a sack from junior safety Solomon McGinty two series later. Following the McGinty sack, the offense found a way back into the game. Junior quarterback Bo Swanson, who saw action with both the first and second team offense, hit senior wideout Dante Shells for a 34-yard completion on his first pass attempt of the afternoon. Junior running back Todd Macon punched it in from two yards out to cap off the drive. On the ensuing series, Masha settled in and led the offense down the field with ease. He found sophomore receiver B.J. Farrow down the right sideline for a 50-yard pass play, and freshman running back Carrington Mosley found the end zone on a 3-yard touchdown run to give the offense a 45-6 lead at that point in the game. The offense took a 42-19 lead into halftime of the game. At halftime, Gill announced this spring’s Samkon Gado Award winners, which are given to the most-improved players during spring practice. The 2016 winners were junior fullback Thomas Kennedy (offense), sophomore linebacker Lucas Irons (defense) and redshirt freshman safety Elijah Benton (special teams). Gill also announced linebacker Zachary Schreiber as the winner of the Luke 2:52 award, given to a graduating senior who best exemplifies the program’s whole-person development mission. The defense bounced back in the second half, aided by sacks from sophomore defensive ends Tolen Avery and Juwan Wells and a 41-yard pick-six from senior safety Alpha Jalloh. Senior corner Wesley Scott did not play in the spring game due to a torn ACL. Scott will likely miss the 2016 season, pending confirmation from the doctors. If Scott cannot play, it would leave a big hole in an already young secondary. “We have young guys that are not afraid to be leaders,” Jalloh said. “They’re not afraid to compete, and that’s what we like and that’s what we need. That’s the future of our program. On the final series of the game, Masha led the offense on a 65-yard drive using a quick tempo and numerous short passes. He connected with sophomore receiver Zac Parker over the middle for the final score of the game. The Flames did not run the ball in the second half and took more shots down the field, particularly with Masha, who has continued to grow as a passer. After sitting behind Josh Woodrum and a different offense for two years, Masha is looking forward to getting his shot in a system built for him. “I really focused on my technique (as a passer) this spring,” Masha said. “Playing quarterback, throwing the ball is all about footwork, so I’ve really been focusing on my footwork. Masha finished the game completing 12 of his 18 pass attempts for 124 yards and a touchdown, unofficially. Junior quarterback Bo Swanson was two-for-three for 49 yards and an interception, while freshman signal-caller Rudiger Yearick was one-for-four for five yards. Gill said things were not as honed as he had wanted, but the development of all three quarterbacks is promising. “Execution was not quite as sharp,” Gill said. “(Swanson) missed a couple throws, (Yearick) missed one or two and I think Masha did the same, so I think the execution can be better. Macon carried the ball six times for 19 yards and a touchdown, and Shells caught five passes for 40 yards. Under new offensive coordinator Joe Dailey, the Flames moved quickly and spread the field on offense, utilizing more option plays and designed quarterback runs for the speedy Masha and taking shots down the field to stretch the defense. Macon, who will likely be the feature back with Desmond Rice and D.J. Abnar gone, looked solid in the spring game and knows he will still have to earn his spot in the backfield. Macon will also be taking handoffs from a different quarterback than the one he saw his first two seasons, and with a new offensive system to boot, things will not be the same for Macon in the backfield. The Flames open their 2016 season on the road when they travel to Blacksburg for an FBS showdown with Virginia Tech Sept. 3. They return to Lynchburg the following week to open their home schedule against Jacksonville Sept. 10.